If you reside in and around the areas of Fort Lauderdale Beach, Weston, Hollywood, Miami or Boca Raton and are looking for luxury boutique condo living overlooking the Intracoastal Waterway, then what can be a better option than Adagio Fort Lauderdale Beach by Alco International Group. ADAGIO is now part of the new projects booming in Florida, especially in the Southeast Metropolitan area. Other projects in the area include, Auberge Beach, W Fort Lauderdale Residences, 321 Residences, proving that Fort Lauderdale is quickly becoming a great place to invest. Alco International Group has more than 50 years of experience in the United States and Latin America with an impressive luxury real estate portfolio, including both residences and retail space. More recently and with great success they completed ADAGIO on the Bay and now are moving forward with ADAGIO Fort Lauderdale Beach. 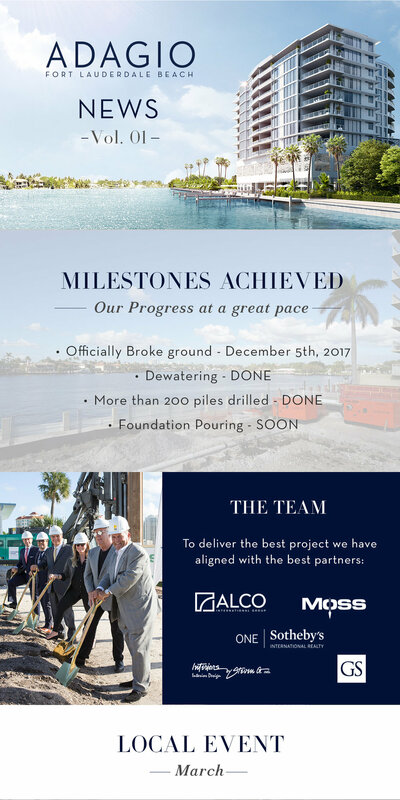 This amazing selection of pre-construction and new construction deals that are are expected to be completed between 2018-2020, include waterfront condos and townhomes with boat dockage, Intracoastal condos, direct oceanfront condos, and are located within walking distance to the Beach. “Fort Lauderdale Beach’s value compared to Miami Beach over the years has improved exponentially. From 1990 to 2010, oceanfront condos in Fort Lauderdale Beach were priced, on a per-square-foot basis, between about 25 percent and 30 percent less than in Miami Beach. In 2015, the difference increased to a whopping 261 percent.” - ISG 2016 report using data from Miami-Dade and Broward counties’ tax records and on-site sales offices .